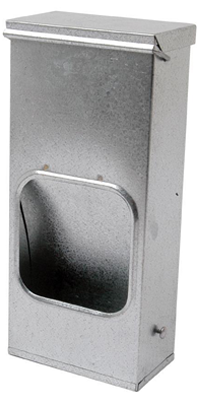 Grit is best supplied in a small flat bottomed container with a drainage hole in the base, or a specially designed grit hopper. It is used to stimulate the appetite, develop the gizzard muscle, digest food, and mixed grit helps with the shell quality in laying birds. Flint chips act as the bird’s teeth and assist in breaking down the food in the gizzard and the oyster shell provides valuable calcium. Between 3 and 10 weeks of age the grit particles should be 2-3 mm.and 3-4mm after 10 weeks. 3-10 week old birds will consume approximately 3g per bird per week and after 10 weeks approximately 4-5g per bird per week. It’s a common misconception, even among seasoned poultry keepers, that their hens don’t need extra grit, either because they are free range and find all the required grit outside, or because they are given crushed shells from the eggs they have laid to provide plenty of calcium. If the range is in clay or limestone soil, there may be a shortage of flint and in flint areas the pasture will contain less calcium. For a hen to be kept in peak condition, it needs a healthy digestive system, and to produce an abundant supply of good quality eggs, it needs an adequate and constant supply of calcium. In either case, the hen needs grit. There are two different kinds of grit and both play an important part in keeping your hens in healthy condition. Insoluble grit, which includes angular, granite and flint chips, is essential to a hen’s general health from as early as two days of age, and is needed throughout the life of the bird. There are few areas of the UK that have enough loose surface flint, or granite, to preclude the use of additional grit. Grit helps to grind and break down the food in the gizzard, the muscular part of the hen’s stomach, and if given from an early age, it promotes good muscular development of the immature gizzard. The efficiency of the gizzard and the health of the digestive system play a vital role in the general health of the hen, and only healthy hens produce of good quality eggs. Insoluble grit is available in three sizes, and the size should be as large as possible for the size of the bird, because a size that is too small will pass straight through the digestive system without being used. The stones in the grit should be sharp and not rounded and it should be available at all times in a separate, flat bottomed container that can’t be tipped over- a dog bowl or low sided flower pot is ideal. Mixing the grit with the feed is not advisable, as much of it will be flicked out onto the ground where it will be wasted in wet or muddy conditions. It is of particular importance to free range hens which may have access to long grasses or stringy vegetation, and the associated risk of impacted gizzard. Soluble grit, which can be purchased in the form of oyster shell, or ready mixed with insoluble grit, provides adult hens with essential calcium for bone formation and egg shell production. It is available in the form of limestone, oyster or cockle shells, and should be fed at the point of lay onwards. It shouldn’t be given to younger birds which are susceptible to kidney failure from an excess of calcium in the diet. The natural availability of calcium for free range hens, depends on the soil type in your area, for example, it will be in short supply in areas of clay or acid soil, and although a poultry layers ration contains the required amount of calcium, this is in powder form and only remains in the digestive system for a few hours, whereas pieces of oyster shell are absorbed slowly by the body over a longer period of time. Feeding of egg shells is not a wise option due to the risk of triggering the habit of egg eating. The average commercial egg shell contains 2.2g of calcium but shells from some traditional breeds contain considerably more than this. Insufficient calcium in the diet will cause soft or thin egg shells, and can even bring about a temporary pause in lay. Other conditions associated with a deficiency , are pendulous crop, depleted growth of the skeleton, and feather pecking. Poor shell quality may be associated with other health or deficiency issues, such as vitamin D3, Phosphorous, or eggs laid by obese hens, but the primary consideration should be to provide extra soluble grit for good quality shells and bone structure, before looking at any other cause. In summary, the provision of both types of grit for laying hens, is a vital and inexpensive part of good management for producing and maintaining a healthy flock.